Anti bark collars and pet corrector air horn. 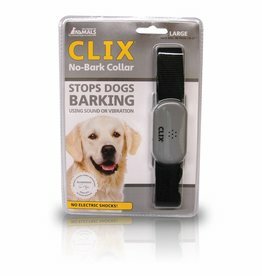 Company of Animals Clix Dog No Bark Collar is a reasonably priced, yet effective way to reduce excessive barking in a considerate way. Company of Animals Pet Corrector Air Horn emits a hiss of compressed gas which produces a broad spectrum sound (white noise) to interrupt a dog’s unwanted behaviour.